In Storyboard Pro, you can export your project’s soundtrack to an audio WAV file. You can either export the different soundtracks as one audio file or export all soundtracks separately. Select File > Export > Soundtracks. From the Destination Path section, click the Browse button. Select and name the folder in which to save the exported soundtrack. In the File Pattern field, you can set your own pattern name. The default File Pattern is %t-A%n.wav. ‣ Process Soundtracks Individually: Exports the different sound layers to be exported as individual soundtracks. ‣ Merge All Soundtracks: Merged all the sound layers onto one single soundtrack. ‣ Don't Break Sound: Exports the sound layers as one complete soundtrack. Depending on whether you selected to export the sound layers individually or merged, one single soundtrack will be exported or one soundtrack per layer will be exported. 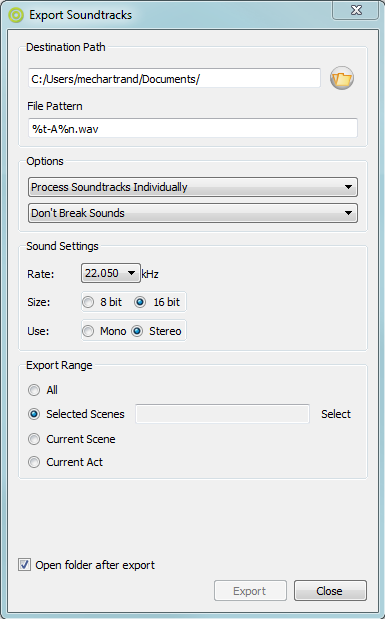 ‣ Break Sound Per Scene: Divides the soundtracks in sound files per scene. Depending on whether you selected to export the sound layers individually or merged, one single soundtrack will be exported per scene or one soundtrack per layer will be exported per scene. ‣ Break Sound Per Sequence: Divides the soundtracks in sound files per sequence. Depending on whether you selected to export your sound layers individually or merged, one single soundtrack will be exported per sequence or one soundtrack per layer will be exported per sequence. ‣ Break Sound Per Act: Divides the soundtracks into sound files per act. Depending on whether you selected to export your sound layers individually or merged, one single soundtrack will be exported per act or one soundtrack per layer will be exported per act. ‣ Rate: Lets you select the Khz sample rate value. A higher value results in a better quality sound but heavier file. ‣ Size: Sets the audio file bit depth to 8 or 16 bit. A higher bit value will result in a better quality sound but heavier file. ‣ Use: Select the exported audio files channels to be either Mono or Stereo. ‣ All: Exports the entire storyboard’s soundtrack. ‣ Current Scene: Exports only the currently selected scene’s soundtrack. ‣ Current Act: Exports only the currently selected act’s soundtrack.